Artist’s studio in Rumah Kijang Mizuma, artworks by Aiko Yamamoto and other artists, photograph taken in 2015. Image courtesy of Rumah Kijang Mizuma and Mizuma Gallery. Rumah Kijang Mizuma is a co-working studio and residency space founded in 2014 by Sueo Mizuma, Executive Director of Mizuma Galleries, curator Hermanto Soerjanto, and artist Angki Purbandono. Established to foster cultural exchange, the space in Yogyakarta, Indonesia brings together artists from Indonesia and Japan in one creative environment. To date, Rumah Kijang Mizuma has hosted 15 Japanese and 7 Indonesian artists with residency durations ranging from two weeks to nine months. The first showcase of works by resident artists will be presented at Mizuma Gallery Singapore this week. Ryuki Yamamoto, 'Portrait Diary' (289 pieces), 2015-2017, acrylic on canvas, 14.8 x 10 cm each. Image courtesy of the artist and Mizuma Gallery. Titled ‘Hopes & Dialogues in Rumah Kijang Mizuma’ and curated by Soerjanto, the group exhibition focuses on the artists' experiences in Yogyakarta and their outlooks on life. Soerjanto noted the clear influence the residency had on Ryuki Yamamoto's work 'Portrait Diary' which reflects his sentiments and interactions. 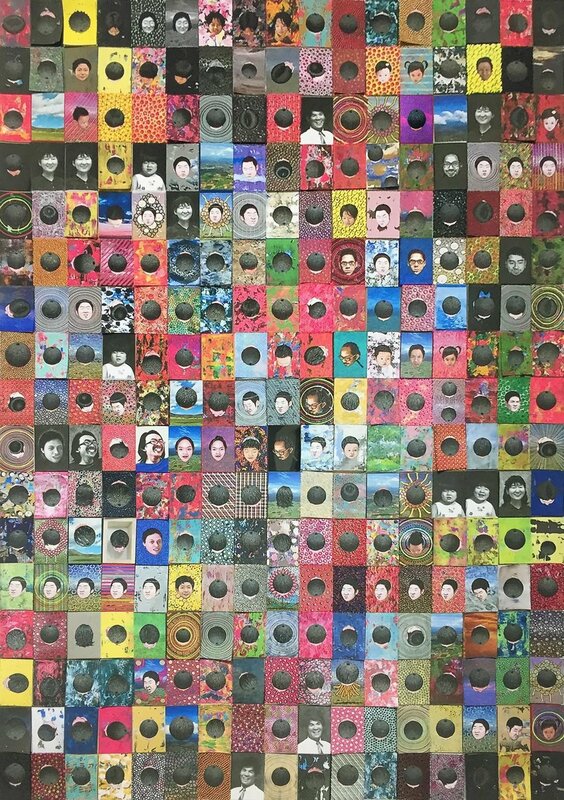 The artist begun moving away from painting only portraits of himself and his mother to also including members of the Rumah Kijang Mizuma family such as Purbandono's son and individuals who support the daily operations of the space. Where new visual elements developed in the work of Japanese resident artists, Soerjanto said that the time spent in residency provided Indonesian participants opportunities for contemplation. This resulted in deeper underlying narratives in their works and an expanded view on art. Yoga Mahendra's three-panel painting 'sesuk yen wes aman walesku opo' (Later when everything is OK, how can I repay) is a commentary on Indonesia's political situation and the ways people hurl insults at each other in the mass media and on the Internet. Yoga Mahendra, 'sesuk yen wes aman walesku opo' (Later when everything is OK, how can I repay), 2018, acrylic on canvas, 140 x 240 cm (3 panels). Image courtesy of the artist and Mizuma Gallery. While the gallery is familiar with most resident artists, Rumah Kijang Mizuma has also hosted artists who are completely new to them. "Often, they would contact us to express their interest in the residency," shared Mr. Mizuma. "In the future, we hope to explore the possibility of making Rumah Kijang Mizuma an alternative art space not only for exchange of ideas and artwork production, but also to showcase them." 'Hopes & Dialogues in Rumah Kijang Mizuma' is on view from 12 January to 10 March 2019. There is also an artist talk happening on 25 January 2019, 6pm to 7pm.